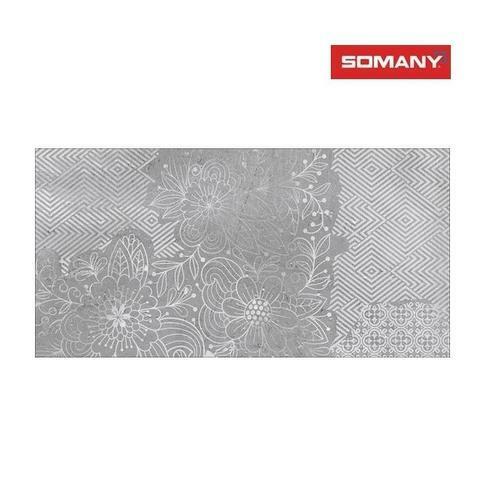 We are the manufacturer and supplier of the Somany T40803046 9.8 mm Calypso Grey HL 01 Wall Tile. With a sphere of influence spanning in India and over four decades of spearheading industry innovation in ceramics and allied products segment, “Somany Ceramics”, has established its presence as a leading and a formidable force in the Indian Tiles Sector. Since 1968, the brand has endeavored to adorn homes with delight, exuberance and vivaciousness resounding with the quality, strength and life of its products. The company holds ISO certificate and has its manufacturing plants in India at Kadi (Gujarat) & Kassar (Haryana), and other joint venture plants, generating a production capacity of 41 million sq. meters annually. The company is a Manufacturer and Supplier of widest product range of Wall Tiles, Ceramic Floor Tiles, Durastone Floor Tiles, GVT And Duragres Floor Tiles, Wall Cladding Tiles, Glosstra Wall Tiles, Trending Tiles, Trending Duragres Tiles etc. as well as the tile laying solutions. Somany has captured the memories of millions of customers by creating trends in home interior design. It has brought about an unprecedented change in the lives of people by consistently evolving with the Indian market. From implementing the newest in technological brilliance to a steadfast practice of lateral thought and trend-setting tenets, to pioneering several first in design and style for consumers, Somany Ceramics determined pursuit of delivering excellence has placed its brand in an illustrious bracket. It was Late Shri H.L. Somany’s vision that propelled the company to emerge as an unchallenged leader in the Indian tile sector. To sustain a dream of such a magnitude, it is always important to stay ahead of your time. This truth, realized by Late Shri H.L. Somany was not only executed through the superior and innovative style and quality of Somany products, but also sustained through the wisdom of the following generations of leaders. With Late Shri H.L. Somany at the helm as founder, Shri Shreekant Somany as the CMD and Shri Abhishek Somany as the MD, the company is heading towards an exciting phase of expansion and growth.